There are people who go with the flow of life but there are other people who tend to move against the flow and define history. 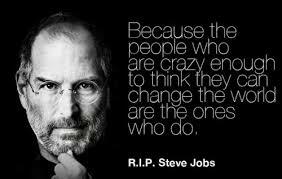 One among those is Steve Jobs. 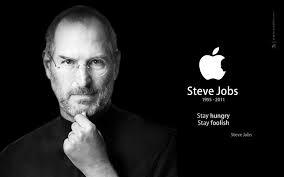 He is the co-founder and CEO of Apple Inc. He is also the CEO and the largest stake holder of Pixar Animation Studios. Let’s look some interesting things of Job’s life. Steve’s biological fathers name is Abdulfattah Jandali. He has a restaurant and a casino owner in Reno, Nevada. His biological mother was Joanne Schieble. She was an American. His father, however, objected to the marriage so Steve was put up for adoption. His adoptive parents were Clara and Paul Jobs. Steve actually later described this as the most important things in his life and believed that unless someone understood his counter cultural roots they wouldn’t understand his way of thinking. In 1974 Steve traveled to India with his roommate to visit Neem Karoli Baba, a Hindu guru. Upon arrival though, they discovered that the guru had passed away earlier that year. Steve ended up traveling the country for seven months, after that he returned to US with a shaved head and traditional Indian clothes. While his journey through the India he was influenced heavily by the religion even to the point of having his marriage presided over by Kobun Chino, a Buddhist monk. Steve married to Laurene in Yosemite national park. She was an MBA graduate of Stanford and was appointed by President Barack Obama to be a member of the White House Council for Community Solutions due to her active involvement in the non-profit community. Steve never actually made his views on charity clear and it is certainly indisputable that he made an impact on the world. Steve didn’t give to charity so he must have hoarded it all. Not Steve. Since 1998 he has received 1 dollar every year from Apple. It seems almost unthinkable but before Steve Jobs was conquering the world with his iPods he was out on the street telling people iBroke. Luckily for him he had some good friends so after dropping out of college they let him do some couch surfing. When Steve was a kid he would attend local lectures put on by Hewlett-Packard. After one of the lectures he approached William Hewlett because he needed some computer parts for a project. Evidently Will was so impressed by Steve he gave him the parts and then offered him an internship on the spot. Animation in Hollywood seemed to be a dying art until Steve came along and acquired The Graphics Group from Lucas Films for $10 million and turned it into the Pixar. As a result of Steve’s partnership with Disney, Steve he lit the spark that led to movies like Finding Nemo, The Incredibles, and WALL-E. For almost 15 years he dominated the animation industry but Toy Story was a more personal endeavor as he was Executive Producer. After working on the famous Atari game Breakout they unofficially agreed to split their cut in half. Steve, being a cunning businessman, had other plans. Although Apple gave Steve $5,000 for their work he told Wozniak that he had only received $700. Wozniak later found out about it and said he would have given him the money had Steve told him that he needed it. Prior to marrying Laurene, Steve had a child with Chris-Anne Brennan named Lisa. This was right around the time that Apple was taking off so he ended up denying paternity. Eventually, though, he changed his mind and at the end of the day he paid Lisa’s way to Harvard. The ultimate make-up present. The New York Times recently revealed that Steve has 313 patents to his name. To give you some perspective, out of his peers Bill Gates holds about 9 and the Google boys have roughly a dozen between them. He was the largest individual shareholder in Disney with 7% stake in the company after Pixar was bought out. He also held a spot on the Board of Directors. The next largest shareholder is its former CEO Michael Eisner coming in at 1.7%. Steve Jobs and Steve Wozniak started Apple in his garage shortly after Wozniak came out with the Apple 1 computer. From those humble beginnings Apple has grown into one of the largest companies in the world with $350 million in market value.